WPML is a revolutionary solution for the fast and efficient translation of your website texts. Do you have a WordPress website? And do you want to provide a fast service to your international business relations? WPML offers a world of difference in handling, costs, convenience, speed and efficiency. But with the same quality and now at permanently reduced rates. You choose the content and the required languages. Our professionals will translate your texts. Thanks to WPML, the translations are immediately placed on your website in the existing format. Want to learn more? Click here. AVANTI Language Services is one of the few WPML-accredited translation agencies in Europe and as at 2018 the only one in the Netherlands! You can benefit straight away from added convenience and lower costs. Install the WPML plug-in now! It couldn’t be easier. WPML is a plug-in for WordPress that enables you to send the content of your website directly to us by automated means so we can translate it into the languages you require. Once our copywriters have translated your text, the translation is automatically placed correctly within your existing website. Nice and quick! Also handy if your website builder is unfamiliar with the target language. It all takes care of itself. All you have to do is choose which pages you want to be translated (anything from one page to the whole site). We will receive an automatic notification from the WPML environment and immediately set to work. Click here to find out how WPML works. You don’t yet have a WPML plug-in? 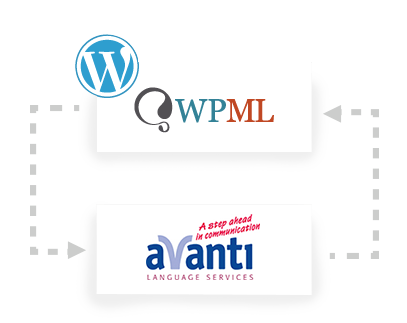 Click here and then click on Buy WPML for AVANTI Language Services. You already have a WPML plug-in? Then request a free token so that you can send your content to AVANTI to request a quotation or obtain a translation. Calculate the cost of your WPML translation yourself!